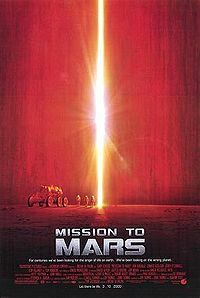 Lost in the 2000 – 2001 shuffle of competing Hollywood Mars movies — including titles such as Red Planet (2000) and John Carpenter’s Ghosts of Mars (2001) — Brian De Palma’s Mission to Mars remains a genre film that many people don’t seem to remember very clearly. Or with much admiration. Film critics savaged it, finding it difficult to comprehend that firebrand Brian De Palma — mastermind of the blazing Scarface (1983) and the subversive Blow Out (1981) — was behind it. Why? Well the quotation excerpted at the top of this review provides some indication. Mission to Mars is a film entirely eschewing corruption, cynicism and other earthbound traits of human impropriety or misbehavior, thus making it entirely out-of-step with the kind of movies that have been popular since the “Dark Age” of genre entertainment commenced in the 1990s. De Palma cleverly revised and contextualized 1920s-era American history in The Untouchables (1987) so as to engage in heroic myth-making on a grand scale. This was a response to the fact that America was a young country in global terms, without the supporting bedrock myths of older, more established nations. Thus Eliot Ness became an updated cowboy, an avenging white knight bringing justice to the “wild west” of Chicago. Al Capone was similarly transformed from thug and crook into a corrupt tyrant on par with Mussolini. With Mission to Mars, De Palma undertakes a similarly bold task. Specifically, the director here fashions a flat-out Romantic space adventure; one that — in the accepted style of that genre — emphasizes human feelings, imagination and intuition, and which culminates in an emotionally satisfying, uplifting and transcendental climax. In broad terms, Mission to Mars involves brave, selfless, futuristic heroes on a romantic quest to tame Mars and cope with the final frontier. They discover at the end of that journey nothing less than the ultimate human knowledge. Sure, there be monsters here (a seemingly-sentient Martian tornado rears and coils its head like a mythical dragon…) but the monsters of the film are all technological in nature, not psychological. Mission to Mars fulfills virtually all of those criteria, thus accurately meriting the descriptor of “romantic.” Let’s take them one at a time. First, consider the very heroic, very noble astronauts in the film. After dutifully making mission plans and adhering to technical protocols, they adjust on the fly when confronted with disaster again and again. Ingenuity — not reliance on tech — is definitely the order of the day. Plain and simple: these guys (and gal) survive on their wits. When a micro-meteorite (another technological “monster”) breaches the hull of the astronauts’ ship and they can’t pinpoint the origin of a deadly air leak, astronaut Jim McConnell (Gary Sinise) has a brainstorm. Using a futuristic soda container, he sprays the liquid inside a zero-gravity chamber to “seek out” the location of the breach. Similarly, when the ship’s engine explodes, mission commander Woody Blake (Tim Robbins) improvises, suggesting a dangerous unplanned EVA and rendezvous with another ship in Mars orbit. And again, after his team is murdered by a Martian “security system” at the Face on Mars on the mesas of Cydonia, Mars 1 commander Luke Graham (Don Cheadle) spontaneously improvises his survival shelter, creating a delicate ecosystem and balance of life (in coordination with oxygen-providing plants). Even the ultimate solution of the alien puzzle — which requires a signal be sent to the Face on Mars using human DNA — is reached under the auspices of human intuition; by McConnell’s sudden flash of inspiration. This insight is visualized by De Palma using the technique of the flashback (one involving candy/M & Ms, of all things). Going even further, McConnell reached this solution after consulting with Luke, a man who lived on Mars alone for almost a year, and thus fits the Romantic ideal of leading a “solitary life” away from society and its accepted boundaries. Cumulatively, it’s not that Mission to Mars is anti-science; it’s that the astronauts primarily rely on their human instincts to weather the various storms they encounter. Technology is a useful tool and assistant in a pinch, but not dependable to solve a crisis. A (technological) radar sweep of the Face on Mars is what activates the alien security system and kills the Mars 1 crew in the first place. The computers on the ship fail at a critical point, and the engines are left damaged…undetected. When not guided by human, romantic qualities (ingenuity, instinct, spontaneity, inspiration), technology can be very deadly, the film reminds us. I also noted above that Romantic works of art often involve “national” or “ethnic” origins, and Mission to Mars again fits the bill, with the slight variation that it is actually a “global” origin revealed here. The astronauts on Mars are grouped (by the Martian sentinel) as citizens of a planet; not merely an ethnic group, or people of a single country. The astronauts discover the Face on Mars, and when they travel inside the vast alien structure, learn that Martians seeded life on Earth. That, in the words of the film: “They’re us. We’re them.” Humanity originated…on Mars. The journey to Mars has thus been a journey of self-discovery, not just a visit to another world. We learn, at long last, where we came from. Who we are. And in this discovery, we find a specific rejection of traditional religious values. It was not God who created Man in his own image, as superstition would have it, but the ancient Martians. If “God” is responsible in other words, then “God” is surely an alien. Thus Mission to Mars entirely subtracts the divine from the human equation, and lauds the ingenuity and curiosity of mortal, ephemeral, natural beings. At the conclusion of Mission to Mars, Jim (Sinise) undergoes the spiritual awakening we would expect from a film of Romantic quality. He experiences an extraordinary epiphany — which we share, thanks to De Palma’s clever use of the montage — in which the characters looks back across the entire sweep and movement of his life. He sees that every instant, every choice, every decision has led him to this moment on Mars; this moment of awaking. Of awareness. He sees images of his dead wife (Kim Delaney); and remembers her instinctive, emotional belief that “the universe is not chaos; it’s connection,” that “life reaches out to life.” This is the revelation that has led man to Mars; that once led the Martians to seed Earth; and which will lead — in the transcendental finale — to Jim’s journey to another galaxy. From start to finish, Mission to Mars fits the mold of Romantic literature and philosophy. Yet for many critics, the virtuous, unblemished adventure of Mission to Mars was apparently a bridge too far, and they greeted the non-cynical Mission to Mars with…cynicism. Reading these snippets, it’s abundantly clear that these (and other) reviewers were unwilling to approach Mission to Mars with even the smallest sense of innocence or astonishment. 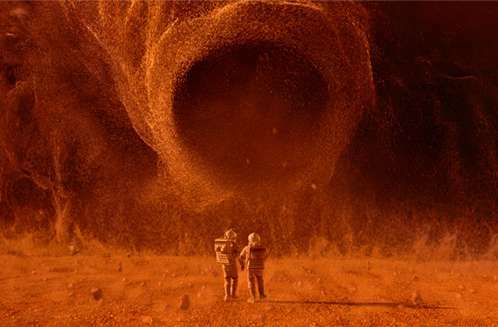 Yet if they can’t understand why astronauts are heroic and noble; if they can’t feel some sense of wonder at a splendidly-visualized expedition to Mars and an emotional revelation about mankind’s prehistoric origin, then something is missing in them; not in De Palma’s movie. How exactly has a Romantic mission of space exploration become something “highfalutin” and not an opportunity to feel…child-like? Did critics even try to meet the movie Mission to Mars on the terms it set out for itself? Or is innocence as extinct as the film’s ancient Martians? Judging by reactions, Mission to Mars remains out-of-step with the entertainment of the 2000s. It’s the Romantic response to an age of cynicism, and technology dominating humanity. The film’s dialogue, esprit-de-corps and emotionality — all part and parcel of Romanticism — were interpreted by cynics in the audience as being simply “corny,” or “cheesy.” We have forgotten, it seems, how to take a film at face value. When confronted with honesty and sincerity in our entertainment, we recoil and try to act superior to it. We mock it, instead of legitimately countenancing and feeling it. I submit this is what happened with Mission to Mars. Here, four astronauts — with nothing to hold onto but each other (another canny visualize of the film’s Romantic motifs…) — traverse the emptiness of space and attempt not merely to survive; but to rescue their friend on the surface (Luke) below. Woody Blake makes a heroic but dangerous maneuver to save his wife and his comrades. He manages to attach a tether to the REMO, but then overshoots the ship himself…and begins a long slow drift into the atmosphere of Mars…where he will burn up. Space affords no second chances. The special effects are rendered with great beauty, accuracy and precision in this sequence, and they reflect the perspective of a director who understands what good framing can mean. For an uncomfortably long period, man and wife stare at each other across a relatively small and yet entirely un-traversable gap; on opposite sides of the composition. They are lost to one another, able to communicate and see…but not able to touch. It’s…agonizing. When it becomes plain to Blake that his wife, Terri (Connie Nielson) is going to die attempting to save him, he commits the ultimate act of chivalry (another Romantic quality?) He removes his helmet, thus killing himself and stopping any doomed-to-failure rescue attempts. In his final gesture, however, there is no terror, no fear. Only acceptance. Throughout this scene, De Palma’s unsettled, dizzying camera captures all this orbital action with a sort of vertigo-inducing intensity. It’s a very convincing depiction of man in space, and more to the point, terrifying…even to passive spectators. The scene successfully posits the idea of humans as small, adrift creatures in the vast cosmos; which is just the right touch for a second act crisis; before man’s place in the universe is discovered and affirmed in the third act. Later, the camera tricks us again, showing us the imposing mesa on Mars and leading us to believe it might be the source of water. In fact, it is the Face on Mars — an alien structure — buried under rock and dust. One discovery has been mistaken for another. The crew has acted on hubris and made a mistake. They assumed they were the only intelligent life on the planet. The critical viewer may also pick-up on the fact that Mission to Mars — perhaps more than any other De Palma film, relies on the first-person subjective point of view at critical points in the narrative, especially during the last act. This occurs so that De Palma can reel us — the audience — into the spiritual climax. His P.O.V. shots, which position the camera amongst the astronauts, remind us that we too are team members sharing this transcendental adventure. We are part of the journey. If Mission to Mars has any real failing, it is a failing in special effects technology. The spacecraft action and the landscapes on Mars remain positively stunning, but the depiction of the Martian Being in the film’s denouement leaves something to be desired. (And that single tear may be gilding the lily, even for a film of the Romantic school). The alien appearance does not hold up particularly well in 2009, alas. I watched Close Encounters of the Third Kind on Blu-ray last week (review to come soon…!) and the live-action animatronic aliens featured in that Spielberg film — produced over 30 years ago — hold up far better than the CGI E.T. in Mission to Mars, created just eight years ago. This is very much a case in which a director is undercut by the vicissitudes (and advancements) of technology. Mission to Mars features a number of De-Palma trade-mark tributes (to Kubrick, to Cameron, to Spielberg, to Clarke, even to Byron Haskin), but in some critical, entirely beneficial way, this is one of De Palma’s most direct, simple efforts. The meta-textual stuff is simply not that important here; and it plays second fiddle to the film’s Romantic depiction of astronauts and the space pioneer milieu. In Mission to Mars, De Palma created an inspiring film about the breadth of human imagination and ingenuity. It’s also a film about how — as a culture — we have seemingly lost the will and capacity to do the hard work of reaching for the stars. How, as a people, we have stopped dreaming about the next horizon (a fault not shared by the film’s Woody, who wears a necklace of a “Flash Gordon” spaceship around his neck as a reminder of the fantasies that guide him). We’d rather see a film about brooding heroes vetting black-hearted vengeance against despicable terrorists than one that imagines that the sky really is the limit. And the critical reaction to the film only serves to prove De Palma’s point. He might as well have been speaking Klingon. No one really wanted to look at the mode he was operating in here, or why it matters so much to an understanding (and appreciation) of Mission to Mars. This entry was posted in 2000s, Brian De Palma, cult movie review. Bookmark the permalink. Thanks so much for this lovely appreciation of a lovely film. I didn't get it on first viewing, but after reading Ray Sawhill's equally wonderful appreciation in Salon, I gave it a second chance. Woody's death is one of the most beautiful and poetic images in any science fiction film. You remind me that I need to watch this movie again with my kids. Thank you for your kind comment. Yep, this is one I want to share with Joel (my son), when he's a little older, too. It really is a beautiful film, devoid of irony and cynicism. It doesn't say space travel is easy or devoid of dangers, only that it's worth it. I liked Mission to Mars when I saw it several years, but I didn't realize, until watching it a second time, how beautiful the film really is. This is one of a small handful of De Palma's films that I haven't seen. I remember vividly the amount of flogging this film took (I think it rivals the same amount of punishment the Roman soldiers gave out in The Passion of the Christ). I know that the Ghosts of Mars film also suffered by critics hands. I always enjoyed it, and never understood the criticism. However, like Prince of Darkness, this Carpenter film is getting a better appreciation by fans, now. Hopefully, MtM will, too. Another one to add to my Netflix queue. Thanks for the retrospective and examination, JKM. I look forward to finally taking this in.